1. Kandharis - Language:Kandhari (a dialict of Siraiki, mainly lived in Kandahar, later some moved to Kabul. 2. Kabulis - Language:Kabuli (a dialict of Punjabi), mainly lived in Kabul. 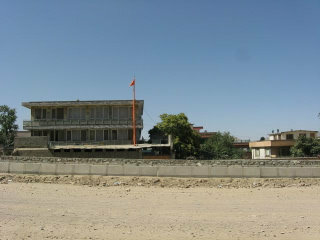 Afghanistan Sikhs have a temple in Karte Parwan known as Dharamsal. 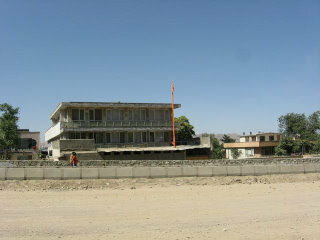 Here, due to the widening of the main road by the Intercontinental Hotel in the past year, buildings were torn down, revealing the Kabul Sikh Temple. Sikhs and Hindus share the Dharamsal temple for worship. They usually worship on Sundays. While the Hindus and Sikhs are often lumped together, we have chosen to write about them separately. While it is commonly reported that the British brought them to Afghanistan in the 19th century, there is an ancient Vedic history in Afghanistan as well. In their modern history, up until the war in the 1990's, they dominated the money bazaar and had thriving businesses. The main places Afghan Sikhs were found were in Kabul, Jalalabad, Ghazni, and Kandahar. There are still a few Sikh shop owners down on the corner at de Afghanan in Kabul City. In the early 1990s there were between 30,000 - 50,000 Hindus and Sikhs in Afghanistan. This is now down to about 1,000. Most fled in 1992 after after Hindu extremists destroyed the Babri Mosque in Ayodhya, in India. There were retaliatory attacks across India, Pakistan and Afghanistan. Attacks worsened when the Taliban came into power, and ethnic cleansing of the Sikhs by the Taliban increased dramatically. 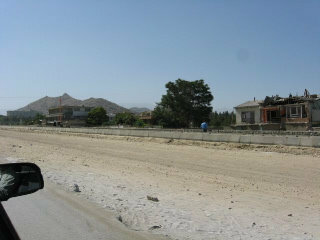 Almost the entire community fled Afghanistan entirely. According to some Sikhs, Kandahar is the current mispronounciation of the Sanskrit term "Gandhar" which was the capital of a flourishing ancient Hindu kingdom. Gandhari's belonged to the region. Afghanistan was a center for Buddhism between the 2nd and 7th centuries A.D. and thus attracted many pilgrims from the subcontinent. From the end of the 6th Century A.D. to end of the 10th Century A.D., Kabul and most of South-eastern Afghanistan was ruled by the “Hindu Shahs”, a series of small dynasties of Hindu faith. Hindus and Sikhs have mostly co-existed peacefully with Afghans until 1992. In their modern history, there were occasional tensions, but even at the Communist time, Sikhs enjoyed recognition of their minority rights. When the Baburi mosque in India was attacked in 1986, the Muslims retaliated against Hindus and Sikhs in Afghanistan. At that time several Hindu temples were burned in Afghanistan. According to the Sikhs, several Afghan place-names bear witness to the Hindu influence: Bagram (Bagi Ram), Laghman (Lam Gan), Parwan (Pagwan), Shakar Dara (Shankar Dara).